SIRI is the implemented femininity on iOS devices although nobody knows how she looks like. Did she improve her communication skills? Yes, she now can control your device (without getting control over you). And she does it even for male users. Femininity and serving even male users can go together. (Ask SIRI ‘What day is the 4th of October’ and she will answer ‘It’s …,October 4, 2013 (SIRI’s birthday)’. Siri lets you use your voice to send messages, schedule meetings, place phone calls, and more. Ask Siri to do things just by talking the way you talk. Siri understands what you say, knows what you mean, and even talks back. Siri is so easy to use and does so much, you’ll keep finding more and more ways to use it. 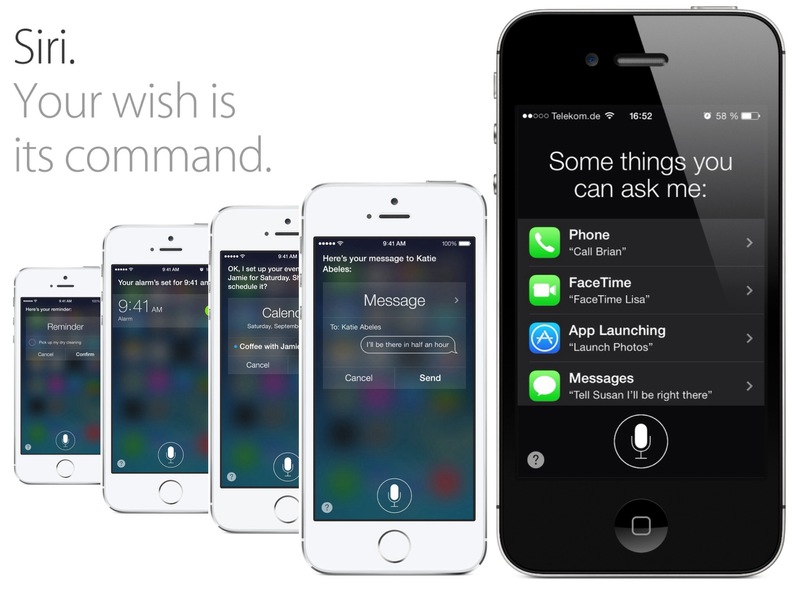 SIRI is a speech recognition (SR) feature. There are two different approaches to let people successfully communicate with machines. Some SR systems use “speaker independent speech recognition” while others use “training” where an individual speaker reads sections of text into the SR system. These systems analyze the person’s specific voice and use it to fine tune the recognition of that person’s speech, resulting in more accurate transcription. Systems that do not use training are called “speaker independent” systems. Systems that use training are called “speaker dependent” systems. SIRI is a speaker independent system so you have to follow the rules for successful communication. 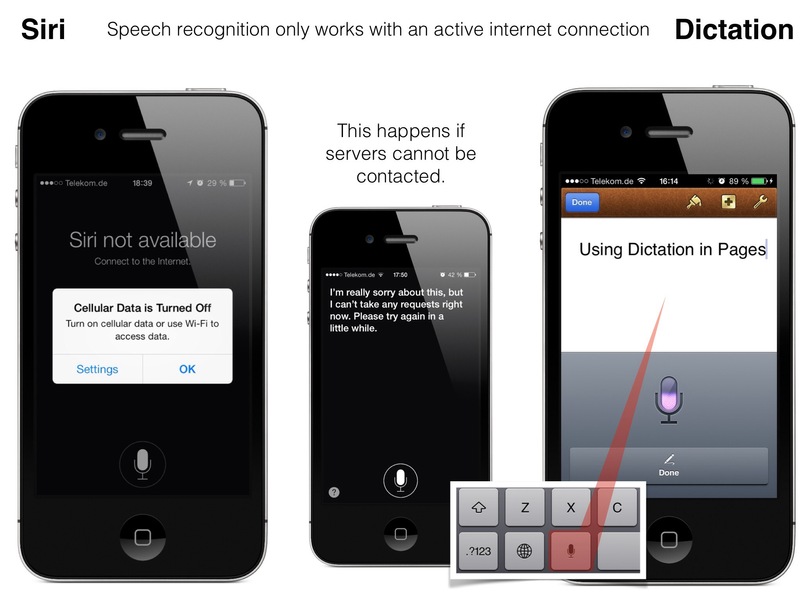 Siri is different from the dictation feature for iOS devices but it also needs an active internet connection to return a stream of characters. All these disturbances are likely to think that SIRI is a woman beyond nature. Right. That’s the reason why we have still no photo of her, even the NSA is lacking reliable information about her. Joke apart. It’s not SIRI who does the work, it’s the power of cloud servers deeded with subtle algorithms to interpret what has been said. SIRI is just the mail carrier. The hard work is done by complex mathematical operations on cloud servers when a human voice packet arrives, going to be interpreted and information sent back to your device where it can be executed e.g. to open an application. 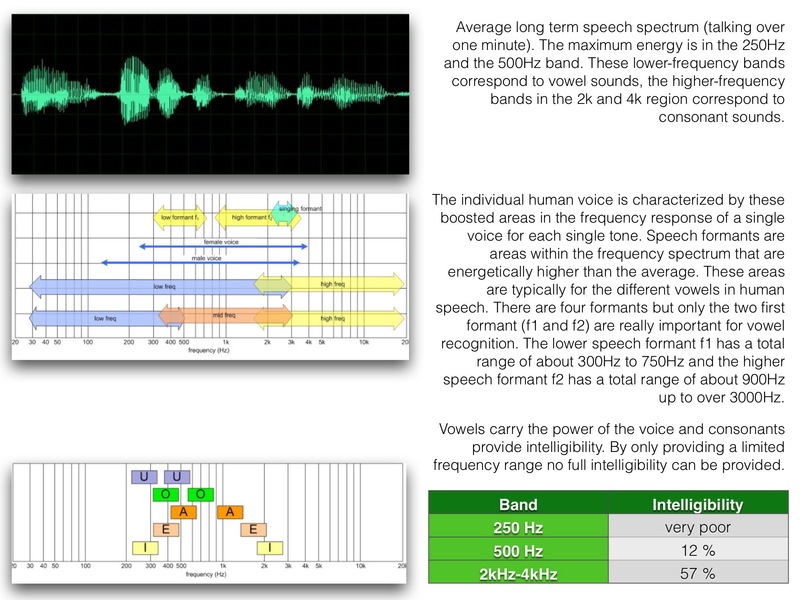 These basic results of the analysis of human voice have to be considered when retrieving appropriate, machine readable information to give an answer on what the user requested. Don’t ask me how it works in details. To describe all this would mean to post at least some miles of text. Apple had early visions of a voice-assisted future. In the late 1980s, Apple came up with a concept called Knowledge Navigator. The company produced a series of videos that showed people interacting with this fictitious system via a touch screen tablet and natural conversation. Its avatar looked and sounded perfectly human, and it could conduct a flawless conversation with you to help you plan your schedule, communicate with friends and colleagues, and access all sorts of networked information. They haven’t quite reached the level of interaction and sophistication displayed in those videos, but with the release of the revamped version of SIRI Apple has taken the another big step toward this futuristic vision. Other device manufacturers and software retailers have had speech-recognition applications on the market for a while, as well. Third-party apps like Nuance’s Dragon Dictate and its newer Dragon NaturallySpeaking voice dictation applications have been available since the 1990s. We’ve been talking to automated phone systems for years (primitive ancestors of the more robust dictation and assistant programs of today). Voice-recognition technology is even being used for things like entry of patient information at hospitals. But most of these are still demonstrations of voice-recognition artificial intelligence (AI) in its infancy, able to only perform simple tasks like taking down what you say or responding to a limited number of preset commands. Siri takes the technology quite a few steps further. It was originally a third-party app called Siri Assistant, released in 2010 and slated for release on other platforms, but Apple bought the company, removed it from the App Store and made it a proprietary feature fully integrated with the iPhone’s operating system (iOS). The integrated app was in beta when it was first released in 2011 as part of iOS 5, but since its upgrades in iOS 6 (released in 2012), it is considered fully functional and improved with iOS 7, mainly with features for controlling the device. Siri came native on iPhone 4S and later, iPad with Retina Display, iPad Mini and the fifth-generation iPod Touch, but isn’t available for prior models. Unlike a search engine that returns long raw lists of links related to keywords you select, Siri is designed to interpret your request, hone in on what it thinks you want, and perform actions to give you a more limited but more correct amount of data or services in return. Siri understands context. Requests are sent to cloud servers to be interpreted and for retrieving answers via third party services. Anything related to mathematical computation or scientific facts is likely to come from Wolfram Alpha. Information related to businesses like restaurants or retail stores is likely to come from Yelp, although restaurant reservations are through OpenTable. Weather info comes from Apple’s built-in Weather app, powered by Yahoo. And movie time listings, reviews and other movie information would likely come from Rotten Tomatoes. Any request Siri doesn’t understand will cause her to ask you for more information to clarify, or to ask you if you want her to look it up on the Web. She uses your phone’s GPS to retrieve and return information relevant to your current location. Go to Settings – General – Siri, turn on Siri and choose your language. There is an option called ‘Raise to Speak’ which, if turned on, let’s you communicate with Siri when raising your iPhone to your ear and start speaking. It’s the implemented Proximity Sensor which covers this setting. If you go to Settings – General – Siri you will find Apple’s notes about Siri and privacy. When you use Siri, which includes the dictation feature of your device, the things you say and dictate will be recorded and sent to Apple to process your requests. Your device will also send Apple other information, such as your name and nickname; the names, nicknames, and relationship with you (e.g., “my dad”) of your address book contacts; and song names in your collection (collectively, your “User Data”). All of this data is used to help Siri understand you better and recognize what you say. It is not linked to other data that Apple may have from your use of other Apple services. If you have Location Services turned on, the location of your device at the time you make a request will also be sent to Apple to help Siri improve the accuracy of its response to your location-based requests (e.g., “what’s the weather like here today?”). You may choose to turn off Location Services for Siri. To do so, open Settings, tap Privacy, tap Location Services, and slide the Siri switch to “off”. You may choose to turn off Siri at any time. To do so, open Settings, tap General, tap Siri, and slide the Siri switch to “off”. If you turn off Siri, Apple will delete your User Data, as well as your recent voice input data. Older voice input data that has been disassociated from you may be retained for a period of time to generally improve Siri, Dictation and dictation functionality in other Apple products and services. This voice input data may include audio files and transcripts of what you said and related diagnostic data, such as hardware and operating system specifications and performance statistics. According to Apple’s Muller, the company takes steps to ensure that the data is anonymized and only collects the Siri voice clips in order to improve Siri itself. Whenever you speak into Apple’s voice activated personal digital assistant, it ships it off to Apple’s servers for analysis. Apple generates a random number to represent the user and it associates the voice files with that number. This number represents you as far as Siri’s back-end voice analysis system is concerned. Once the voice recording is six months old, Apple disassociates your user number from the clip, deleting the number from the voice file. But it keeps these disassociated files for up to 18 more months for testing and product improvement purposes. Even if the Siri data is not linked directly to users, people should be careful about what they say to their personal digital assistant. “Think before you speak.” makes sense also in real life. 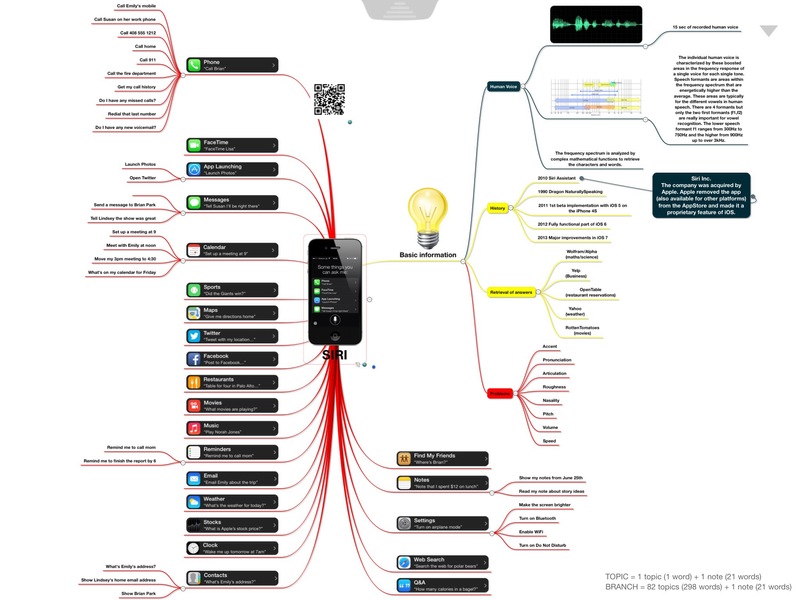 Here is a mind map with all supported features in iOS 7, some examples how to use SIRI (some rules have to receive attention), and some background imformation. Feel free to download this mind map. 1 It doesn’t work without an active internet connection. 2 Controlling your phone by talking to it nerves others when doing it in public places. 3 Sometimes SIRI doesn’t understand you or does something you didn’t want her to do. 4 Relevant settings can be accessed much more faster when using the Control Center of iOS 7. 5 In a public environment talking to SIRI disturbs other people. Apple is working with car manufacturers to integrate Siri into select voice control systems. Through the voice command button on your steering wheel, you’ll be able to ask Siri questions without taking your eyes off the road. To minimize distractions even more, your iOS device’s screen won’t light up. With the Eyes Free feature, ask Siri to call people, select and play music, hear and compose text messages, use Maps and get directions, read your notifications, find calendar information, add reminders, and more. It’s just another way Siri helps you get things done, even when you’re behind the wheel. A big step forward but I see more cons than pros. It seems to me that speech control still is not widely accepted except in a car for increasing security.